SHANGHAI -- Renault unveiled its first full-electric vehicle for the Chinese market at the auto show here on Tuesday. The City K-ZE, a mini-SUV based on the Kwid sold in India, Brazil and other global markets. Sales will start toward the end of this year. The K-ZE was first shown as a concept at the Paris show last autumn. It is the first car produced by the eGT joint venture with Dongfeng and Nissan, which was announced in August 2017. Dongfeng holds 50 percent of eGT, and Renault and Nissan 25 percent each. The City K-ZE will be produced at Dongfeng's factory in Shiyan, China, which has an annual capacity of 120,000 vehicles. 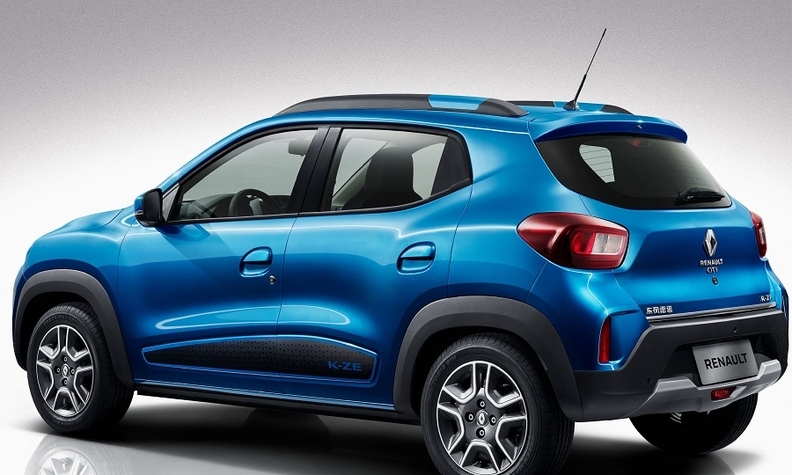 The K-ZE, like the Kwid, rides on the Renault Nissan Mitsubishi alliance's CMF-A platform. It shares most of its sheet metal with the Kwid, although the front end, rear valance and side trim are specific to the K-ZE. The interior layout remains the same, with an eight-inch central infotainment touch screen that is considered large for the category. Renault says sensors monitor air quality and switch automatically between interior and exterior air circulation. The K-ZE has a 2,423 mm (95 inch) wheelbase and 300 liters of trunk space. The K-ZE can be be 80 percent charged in 50 minutes; in regular mode, it takes four hours to reach full charge, which Renault says is "totally adequate for fast-paced urban life." 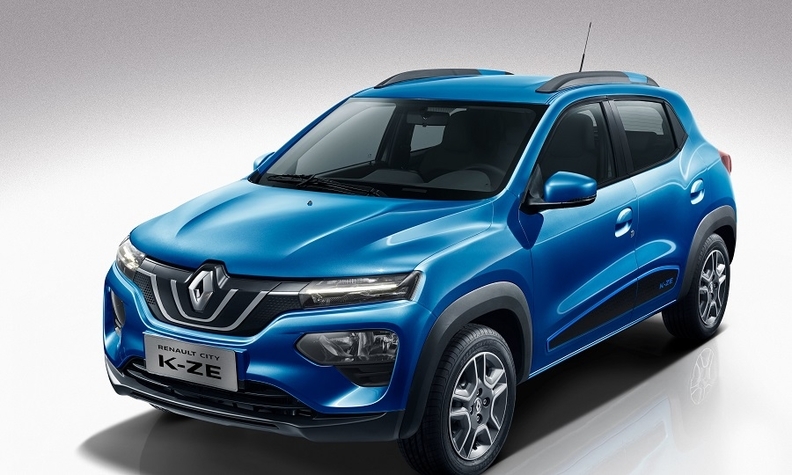 China will be the first market for the K-ZE, but Renault says it is a "global" car that could be sold elsewhere, especially in emerging markets such as India and Brazil. There are no plans as of yet to sell it in Europe. Renault CEO Thierry Bollore said the automaker's ambitions in China remain the same as they were under former CEO and chairman Carlos Ghosn, who remains in detention in Japan, accused of underrepresenting his income and financial breach of trust after his arrest last November in Tokyo. Under Renault's strategic plan, Drive the Future, the target is 550,000 sales in China by 2022, including joint venture partners. Renault plans to build a total of nine passenger vehicles in China by 2022, of which three will be electric vehicles. Last year, total sales were 216,699, with Renault selling 52,734 vehicles and joint venture partner Jinbei & Huasong 163,965, mostly light-commercial vehicles. In 2018, 760,000 electric vehicles were registered in China, a 70 percent increase from 2017. The government has encouraged the market with generous national and local incentives, tax benefits and a quota system that requires automakers to sell a certain percentage of electric or hybrid vehicles. Although incentives are starting to be phased out, the Chinese government expects electric vehicle sales to reach 2 million in 2020, 7 million in 2025 and 16 million in 2030. Under the quota system, automakers will need to amass credits for what the government calls New Energy Vehicles (electric and plug-in hybrids) equivalent to 10 percent of annual sales. The credits will be multiplied for zero emissions vehicles, and automakers will be able to trade and sell credits, so the proportion of electric vehicles sold will most likely be less than 10 percent. The original target was 8 percent of total sales, to begin in 2018, but the government softened the target and moved the implementation date to 2019 to give automakers time to prepare.